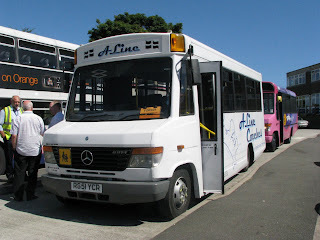 C344 FTT has served A-Line Travel for many years. She started life when new to Seawards Coaches in 1986. Thought after this very little is known about her history so if anyone could help with news or maybe even an old photo of her that would be much apericiated. I don't know when she joined A-Line travel all I know is that she replaced the older bedfords that used to operate there. 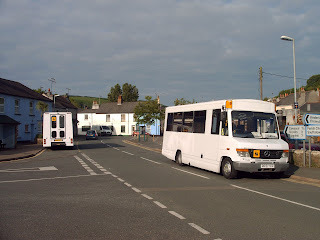 She was in frontline service but was mainly used in her life for the Cawsand-Torpoint school bus. But don't think she was mis-treated. Even after many years operating this she is in very good condition. 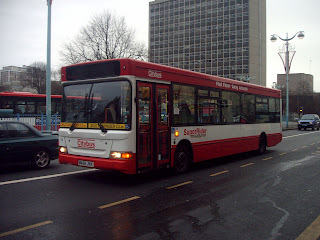 Always has been a very strong and reliable bus. But shortly (i.e. within days) after this photo was taken she was driven away for......scrap! I was to be honested shocked and dismayied that this desistion was taken as she was still such a good little runner and was in very nice condition. I'm sure someone would have taken her on for use in service, as a camper or maybe even preservation. I was even tempted to buy her but the scrap dealer wanted over £1000 for her which I wasn't prepared to pay. So sadly she is just a memory broken up into many pieces. 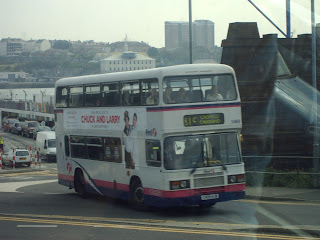 Ex Torpoint Leyland Olympian A167 VFM has been recently sighted working in Truro!!! Famous man of youtube Simon aka Video47. She as reported by Derrick Cuff has been transfered to the newly taken over Truronian routes. 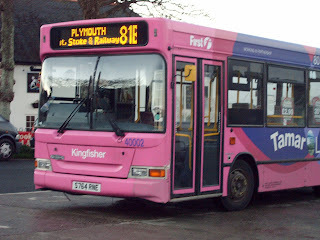 He had a ride on her while operating a T1 service so maybe it'll be worth a trip down there on my local community bus to go and find her! Reported by Simon she has been making knocking noises though is looking very smart as has had a minor overhaul of the interior and as said before the grill and other minor touch ups. Will post more on her as it comes to me! 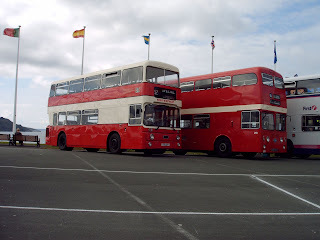 On Sunday 24th August Derrick Cuff will drive his bus out of the depot at Torpoint for the last time. This comes after months of needing change from his daily routine for many years with First and living in the area. Told to me last week by his new employeer Jim Goodard, that he will be coming to him on September 1st to start at his company, A-Line travel. He will run his routes and school services in place of the other drivers to give them a well earned rest after the resent expantion of rotues which I will write about in a further post. Though this is a tempory move. Soon he will be house hunting in Bristol, his home city, where he will work the Airport Shuttle buses from Bristol airport. These will be the bendy and non bendy near new Mercedes Citaros which get people around the airport. With only two stops on route he says " At least I won't be being asked do you go to plymouth!" So it will be sad to see him go but I'm sure he'll have a far better time up there. Even though he won't be driving our Olympians, and seeing many of the friends he has built up in his time down here. So farewell Derrick. We'll miss you!! 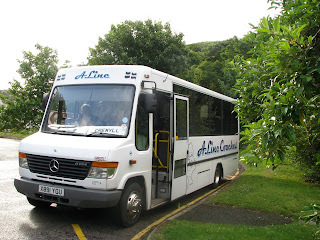 It was only around this time last year I was writing about local company A-Line travel getting a new Mercedes 709 to run the routes. Since then big things have happened and a grant for £40'000 was aproved earlier in the year. Soon after this Jim got to work bus hunting. He was after a Mercedes Vario with wheelchair capeabilities. 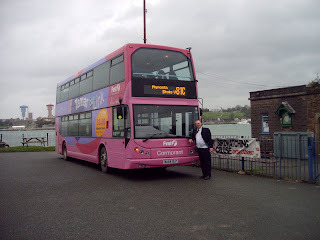 I low floor Dart was not an option because of the route into St John on the way to Torpoint where it gets very narrow. And of course running costs would be higher! So within months the first new Vario arrived. 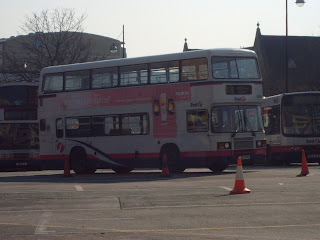 An extremely smart looking X891 YGU was sitting in the depot as I came down to it on a proper summer's day in April! Not like the weather we have now. This bus had the wheelchair lift, had just 30'000km on the clock I think it was, was amazingly clean and tidy inside and out, very comfortable, with a very strong engine! 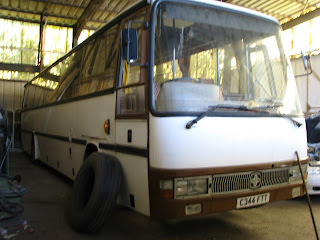 This waited in the depot along with the old Bedford which I will post about in the near future! Then later on came another Vario. This time with different bodywork. R651 YCR was a elderly person's transport vechical in Bristol. One of a large fleet being sold off. 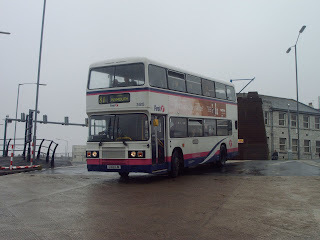 X891 YGU was also used for that kind of thing though not in Bristol. 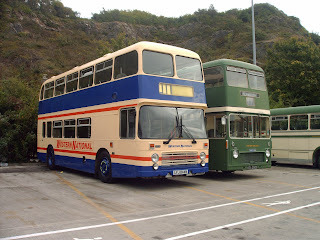 There is very little known to my knowledge about the 2 buses and if anyone could help with some history that would be much apericated. 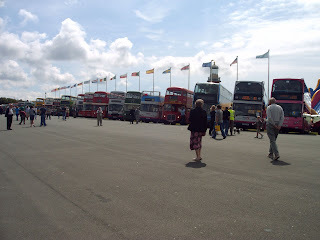 But who would have taken a photo of an old folk's bus! 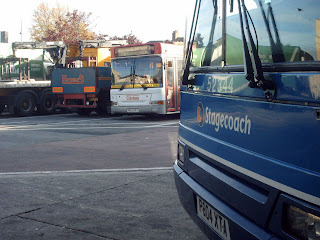 Both have also now been painted in A-Line's brand new livery, much more of a corperate image has now been built up. Yes friends I am going to try and restart this silly old thing I used to do. I know I know I never told you I was even going to stop sorry about that. but time just wasn't on my side! Now I'm a bit more organised so hopefully we'll get some nice constant blogging in the near future! So Lets kick things off! 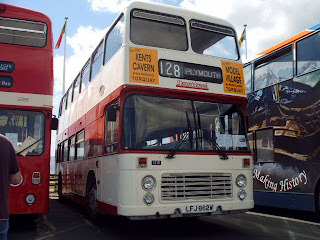 News has come to me that preserved ex Devon Genaral Bristol VR LFJ 862W owned by James Pratt will soon be doing a trip from Exeter around Devon. I received news from a friend that James was inviting fellow enfusiasts like ourselves to to come up to Exeter on the 24th of this month to come and have a long distance trip around the country roads of Devon for a Sunday afternoon with a difference. 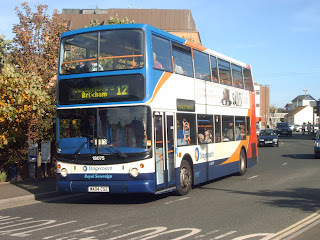 The bus will depart Exeter at 10:00 and will not return for another 7hours and 30 minutes pulling in at approximately 17:30. So a very good trip to look forward to and might turn out very popular. Contact James for further details.